Belize, the little Central-American nation, casts a spell—especially on those with a spirit of adventure. Attractions include the warm, English-speaking people, the natural beauty and the air of freedom and opportunity. A young country (only independent from Great Britain since 1981), Belize has a low population and plenty of empty, wide-open spaces. It’s a country where you can explore and develop, and there’s room to breathe, with a pervasive, heady sense that almost anything goes. 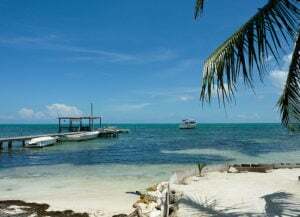 To a growing number of expats weary of regimented, rules-laden lives at home, free-wheeling, casual, affordable Belize has proved almost irresistible. With living costs and property prices sky high in other Caribbean destinations, Belize’s Caribbean coast remains affordable. Below are two of Belize’s islands worth your attention. Like many tourists, I started in Ambergris Caye. This island, and specifically the town of San Pedro, has been an expat haven for decades. There are more expats here than anywhere else in Belize, and it’s no wonder: It offers the most sophisticated lifestyle in the country. If you want to combine casual beach life with upscale goodies, this is the place to do it. Most buildings in San Pedro are still wood-frame clapboard, as they were back when this island was off the beaten path. But today they’re smartly painted. They house the businesses expats want: restaurants, clothing shops, sporting-goods stores and hair salons. The streets are paved, and they hum with cars, bicycles, and the ubiquitous golf carts, the expat’s vehicle of choice. You’ll also find sizable supermarkets, hardware stores, ceramics-and-tile shops, and more. While in San Pedro, I dined in typical restaurants like Caliente and Wild Mango’s, whose wooden back terraces rest on stilts above the island’s white-sand beaches, looking out at the Caribbean. The setting is casual—fitting for a town where flip-flops and sandals are standard wear—but stunning. San Pedro even has a wine shop, Wine de Vine, which hosts wine tastings every Friday night. The night I went, easily two dozen expats came to sample and schmooze. Real estate in San Pedro, though, isn’t as not cheap as other parts of the country–though still affordable compared to other Caribbean islands. When I visited two years ago, I saw several condos near town that were $150,000 or less. They weren’t fancy but they were serviceable, and they’d been on the market awhile. Today properties like those are pretty much gone. Condos under $200,000 here generally need work—in fact, on many parts of the island you’ll pay this much or more for a beachfront lot. Decent, move-in-ready condos near town start at about $250,000; prices of $500,000 are not uncommon. Prices are somewhat cheaper away from San Pedro, toward the north and south ends of the island. You can find both lots and a few developments. A move-in-ready, one-bedroom condo in a small development on the north side was recently going for $165,000. A number are in the $250,000 range. There’s a thriving vacation-rental market here. Yet you can also find full-time rentals at prices that are reasonable. One popular low-rise condo building rents units for about $900 a month. And I met one expat who is renting a three-bedroom house right on the water just a short golf-cart ride from central San Pedro. He pays $1,000 a month. For life the way it used to be on Ambergris Caye, head to Caye Caulker. I arrived in Caye Caulker by water taxi from San Pedro, as many people do. The trip takes half an hour, costs $7.50, and is worth the money—skimming across the Caribbean’s blue waves, you can watch the island’s white-sand shores, fringed with palms, gradually grow closer. This approach also drives home a reality of life here: On Caye Caulker, you really are away from it all. The island is only five miles long and at most a mile wide. Only the southern half is developed; most of the north half is jungle and mangrove—and it’s separated from the south by a channel called the Split (the most popular swimming spot). At Caye Caulker Village, where the water taxis come in, the island is at its narrowest: only three streets wide. These bear the imaginative names of Front, Middle, and Back and are simple packed sand. You’ll see no cars here and only a few golf carts—most people walk or get around by bicycle. And no one’s in a rush. Here, life is all about the water. You can swim and snorkel right off the beach, and the barrier reef is a mile away, an easy trip by motor-boat. In fact, you’ll see boats in many backyards and moored on the lagoon. Walking down Front or Middle Street, about every third weather-beaten, wood-frame house you pass seems to be a tour-guide operator offering diving trips off the barrier reef or the Blue Hole, or for snorkeling in Hol Chan, all big draws in the area. Canadian expats Cindy and Barry Beer have called Caye Caulker home since 2007. “As soon as we got here, we knew this was it,” says Cindy. I chatted with the two on the deck of their simple wooden house, the Caribbean just a stone’s-throw away. Like many houses here, theirs sits on stilts to put it above water surges—Caye Caulker is only eight feet above sea level. The Beers’ boat rests in the sand nearby. The Beers pay $550 a month for rent; they calculate that, with utilities, their monthly fixed expenses run about $800. Vacation rentals are plentiful, says Cindy. But for a long-term rental with a rate as low as theirs, you need to be “on the ground” to find it. 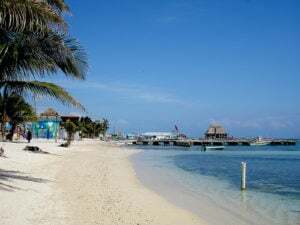 The two admitted that they “don’t go out a lot.” There’s not actually a lot to do on Caye Caulker once the sun goes down, except go out to dinner or drink in bars. The Beers, though, like Caye Caulker’s tranquility. They say that it’s easy to go to San Pedro when they want city thrills—and they find they seldom do. Not all their clients, of course, plan to live here full-time. Some are buying vacation property, others are buying now for retirement later. Many have bought lots. Most expats prefer to live a bit removed from the village’s hubbub. They tend to buy in the new residential neighborhoods south of the village. Lots are marked off and titled, but much is still jungly overgrowth. There are few streets and relatively few houses. But there is plenty of room for growth here, and amenities like a marina and shops have been discussed. Today you can get sea-view lots in this area for under $50,000 and large beachfront lots for under $100,000. Building costs for cement construction run $90 to $125 a square foot, and up to $150 for high-end fittings. Wood construction runs less—about $75 to $100 a square foot. And in both cases, materials must be brought over from the mainland. If you don’t want something fancy, a house doesn’t have to cost much. When the Beers arrived, for instance, their little wooden house was a pile of lumber on the sand. One morning, workmen arrived from Belize’s large Mennonite community on the mainland—and built the house in a flat seven days. The cost? $10,000.